The program represents executing kernel which provides toolkit of construction of competition (group, files, etc.) and base mechanisms of cross check (typical for the overwhelming majority of tournaments). 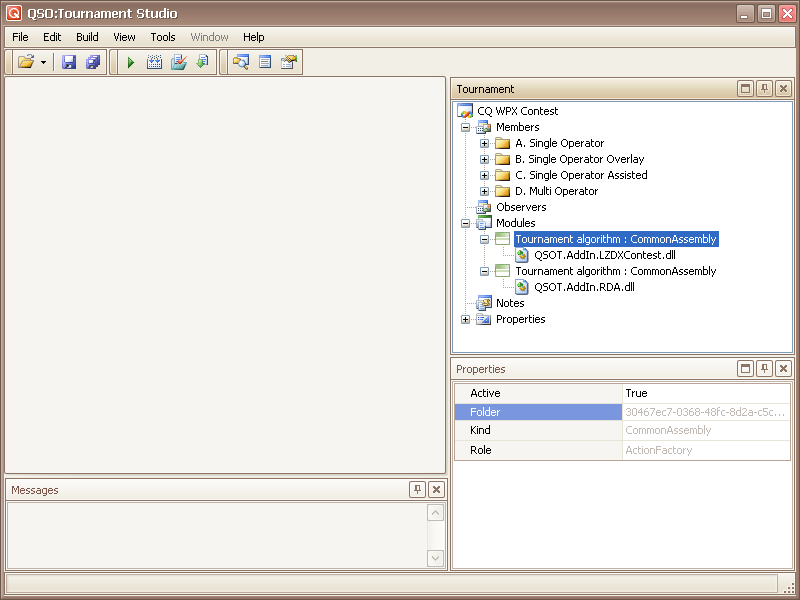 Algorithms of processing of the concrete competitions are connected To a kernel, providing analysis of initial files (parsing), an addition of points based on the results of testing communications and realisation of the additional control ("duplicates", etc.). Connected algorithms in program terms are called as "Modules". 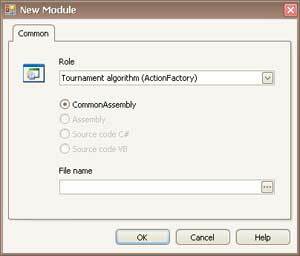 Modules can be a part of the complete set of delivery of the program (these are so-called "Common assemblies") or to be developed by independent developers (in program terms "Assembly .Net"). 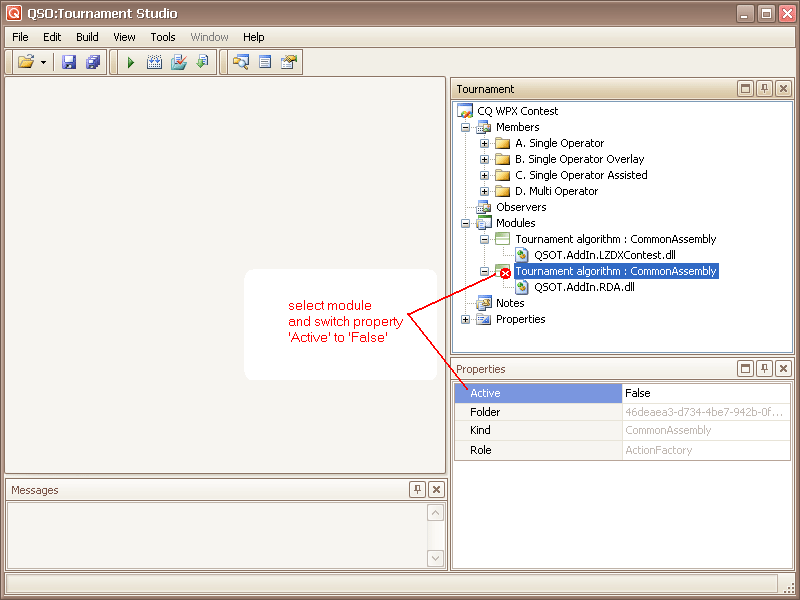 The module can be realised directly in the form of an initial code of algorithm on one of languages .Net (now it C # or VB.Net)..
Click the right button of the mouse on node "Modules" of a tournament tree. 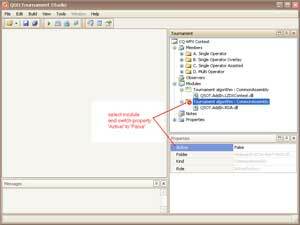 There will be a context menu in which it is necessary to choose "Add Module...". Dialogue of addition of the new module will open. 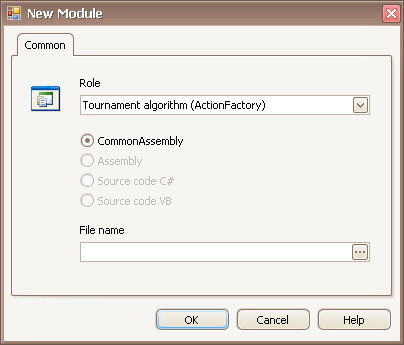 In the appeared dialogue specify "Role" - "Algorithm of Tournament (Action Factory)", type - "Common Assembly", click by the button "..." fields "File name". The repository of the general assemblies will open. In the appeared dialogue select the necessary common assembly and press "OK". 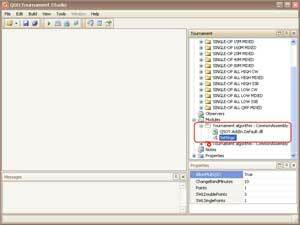 In the field "File name" should appear a name of a file of the assembly. Press button "OK" in dialogue of a choice of the new module. The chosen module will be added in competition. Is admissible to add in competition some modules, for example, to look at result of processing of initial files on different algorithms of competitions. But for correct work of competition it is necessary that one module was active only, the others should be disconnected or removed. 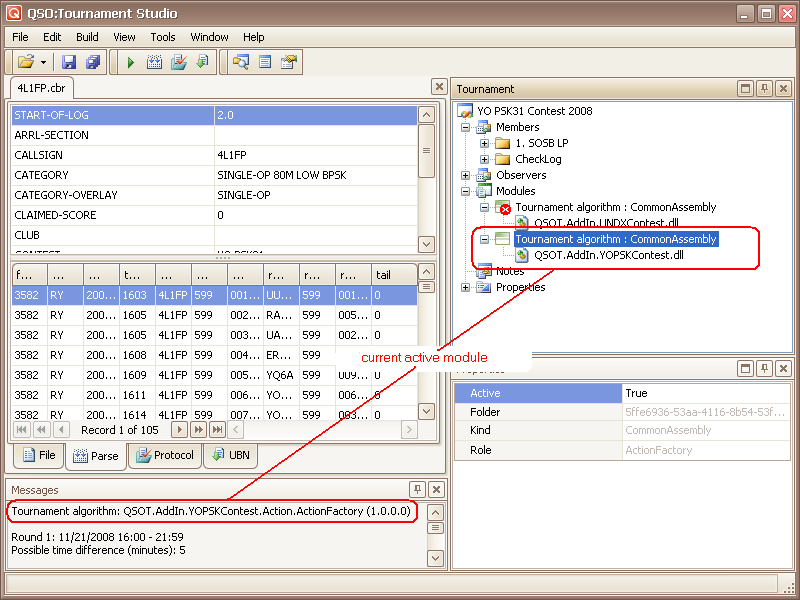 In the shown situation both modules that can lead to incorrect processing of competition are active. It is necessary to disconnect all modules except one which will be used at data processing. If to disconnect (or to remove) all modules of competition, data processing will be made by the internal primitive module making cross check of communications and charging one point for each confirmed QSO. To disconnect the superfluous module click on it the mouse and set property "Active" in value False (in panel "Property"). 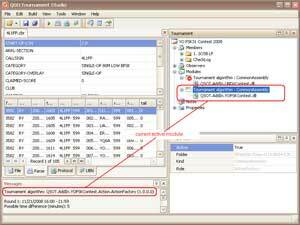 At performance of operations, for the control in the panel of diagnostic messages the module with which use current operation is executed, as a rule, is underlined. Click on the module which should be removed, the right button of the mouse. 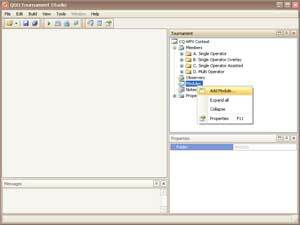 There will be a context menu in which it is necessary to choose "Delete". 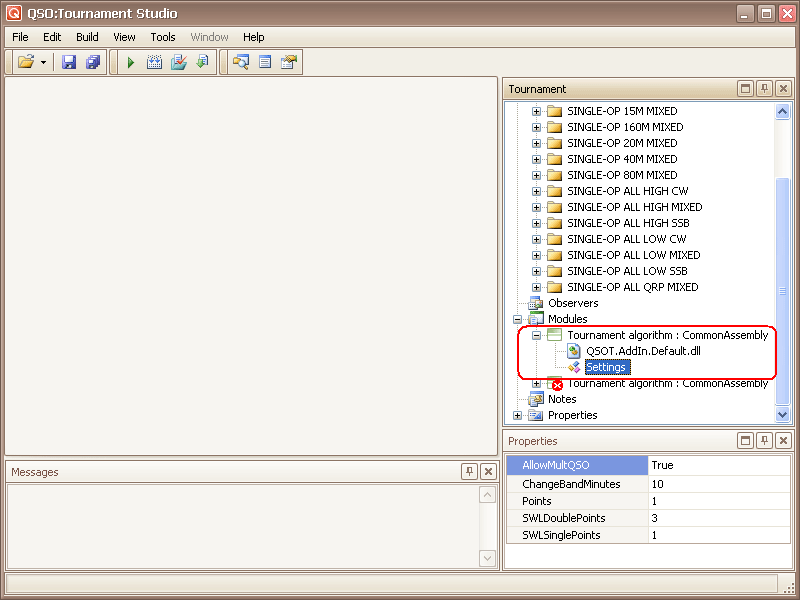 Module node can contain node "Settings" allowing to change parameters of its work. 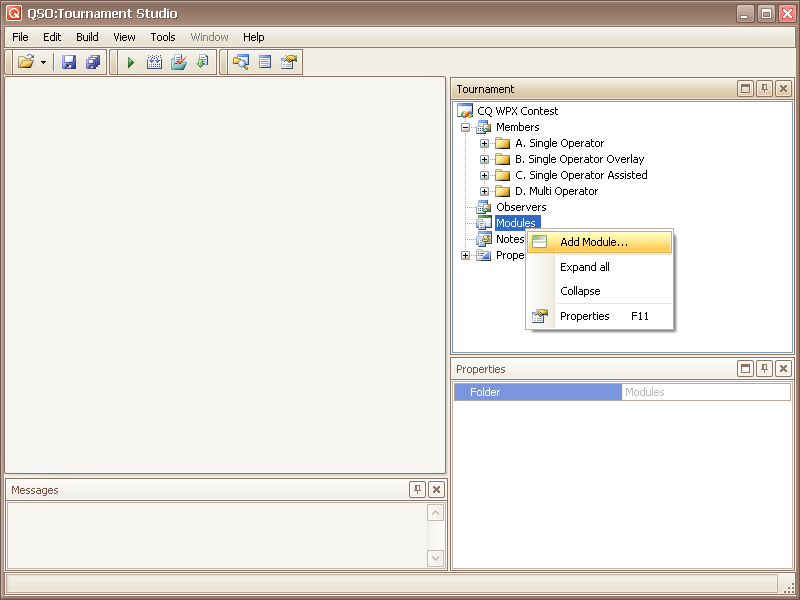 For change of values open module node, select node "Settings" and make changes in "Property" grid.